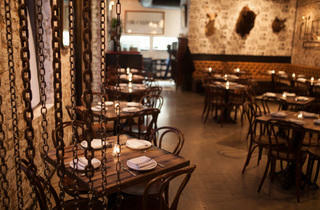 Photograph: Martha WilliamsCharlatan is an Italian restaurant from the Three Aces team. 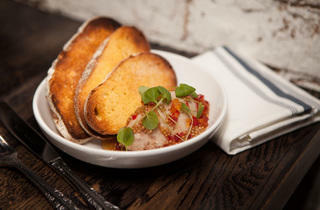 Photograph: Martha WilliamsWhipped mortadella&nbsp;is on the menu at Charlatan. 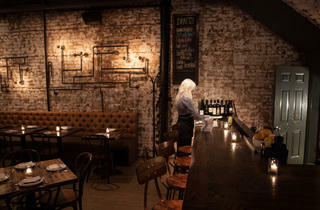 Photograph: Martha WilliamsSquid ink lumache is on the menu at Charlatan. 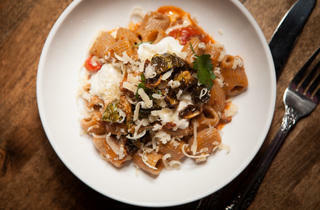 Photograph: Martha WilliamsBlack pepper rigatoni&nbsp;is on the menu at Charlatan. Photograph: Martha WilliamsDr. 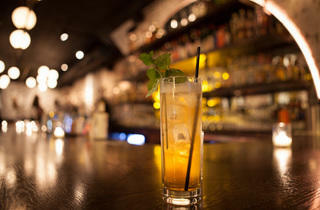 Feelgood cocktail&nbsp;is on the menu at Charlatan. 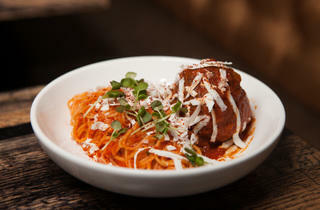 Photograph: Martha WilliamsMeatballs and spaghettini&nbsp;is on the menu at Charlatan. 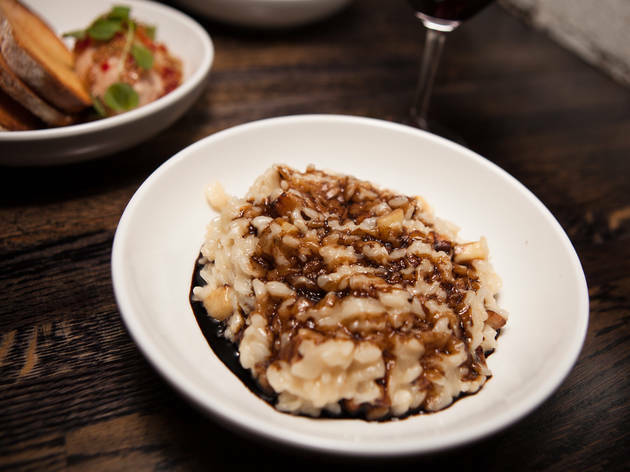 Photograph: Martha WilliamsParsnip risotto&nbsp;is on the menu at Charlatan. 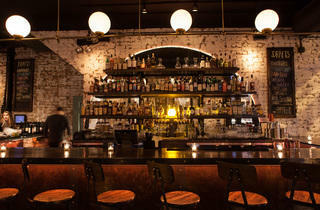 I had dinner at Charlatan on a Friday night and went to a party at sister restaurant Three Aces on Saturday. 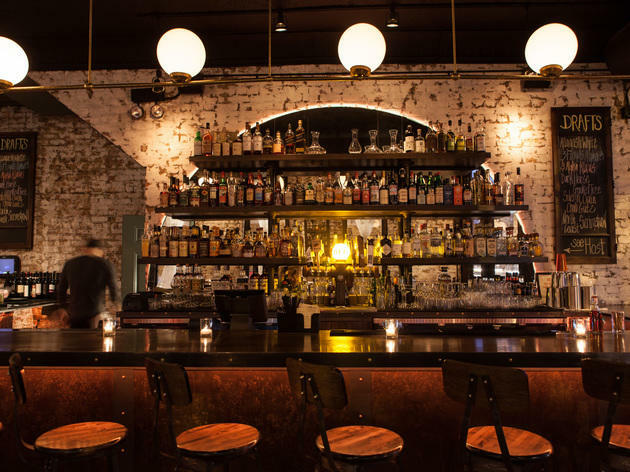 The same person greeted us at the door at each restaurant, and while he was equally friendly at both, at Three Aces he was dressed like a rock star, all black and silver, and at Charlatan he was straitlaced, with a button-down shirt. This sums up the difference between the two places. 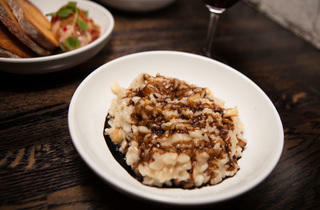 While Three Aces feels like a casual bar, with loud music and a big patio in the summer, Charlatan is a more serious place, where the crowd is a little bit older, and where people aren't packing in for pizzas and $5 Malört and Old Style tallboys on Tuesdays, but snail pasta and Italian wines. 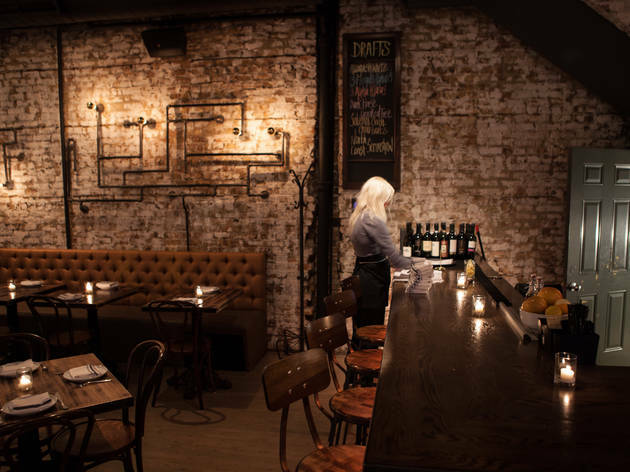 At both, though, the reason you’re going is probably the same—for Matt Troost’s food. 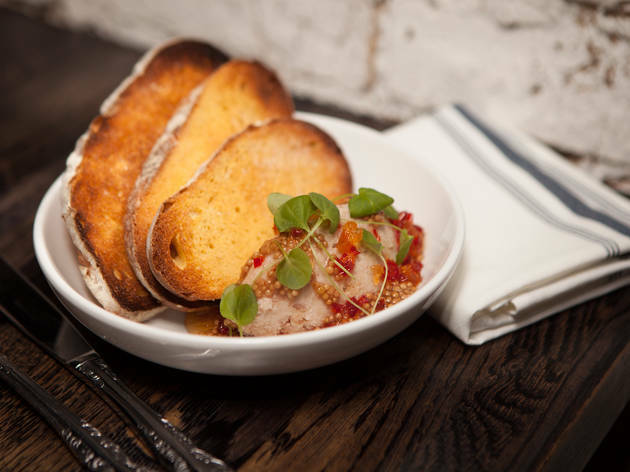 Troost also deals in Italian food at Three Aces, but at Charlatan it’s more elegant. 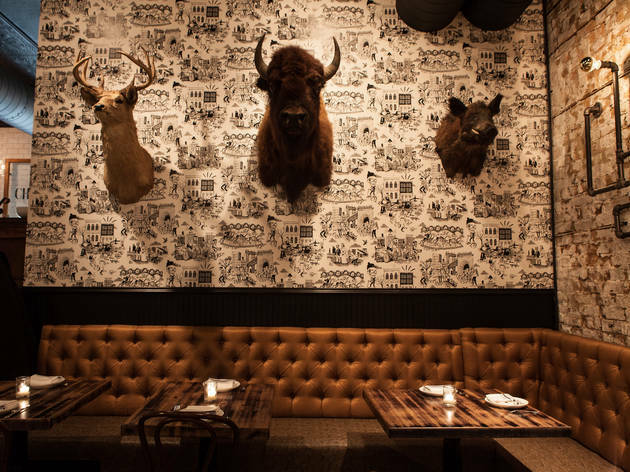 There’s still some fun at Charlatan, which took over the West Town Tavern space: The window outside promises "rock and roll," there’s skeleton-print wallpaper, and of the three animal heads affixed to the wall (deer, boar and bison), two of them appear on the menu. 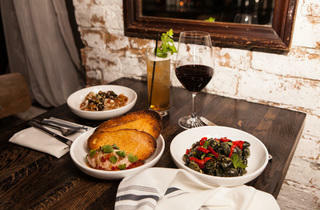 While the menu is fairly short, it’s broken into categories called “Salt and Time,” “Toast and Green,” “Rolled and Extruded,” “Farm and Sea” and “Sides and Bites,” so there’s only prices to help you figure out portion size, and you need to think about what each title means. We had plenty of time to think about it, though, since we were quoted a 90-minute to two-hour wait after walking in at 8pm. 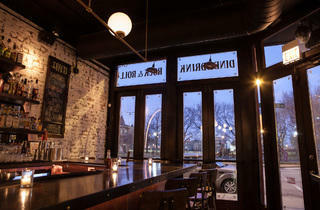 We stood around for 10 minutes in the cramped bar area before grabbing bar seats when they became available. While we waited, we snacked on whipped mortadella, an airy spread accented with pickled mustard seeds and tangy red pepper jelly, and roasted beet bruschetta, a slice of bread piled high with goat cheese, crispy kale and roasted beets, then drizzled with honey. We also dipped into the short cocktail list, which includes the Dr. Feelgood, an easy drinking, fall-like cocktail made with applejack, cardamaro amaro and balsamic topped with Allagash white, and the Dehumanizer, a potent mix of rye, rum, amaro Montenegro, grapefruit and bitters, which would work well as a nightcap. 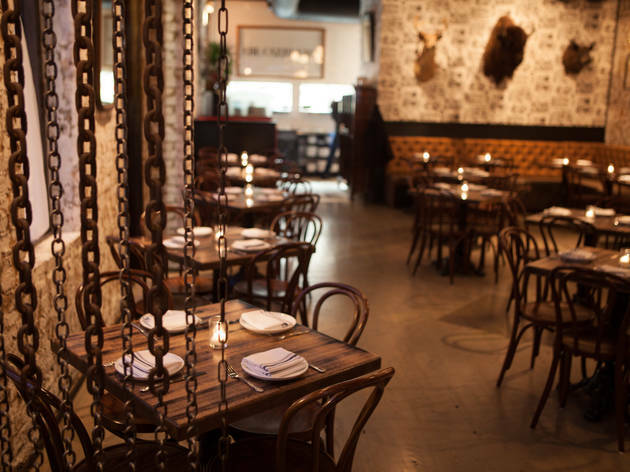 Two hours later, we were at the table, where we turned our attention to pastas, the reason you should go to Charlatan. The six pastas are made in-house, and they’re all available in whole and half sizes, so you can easily try a few different things. 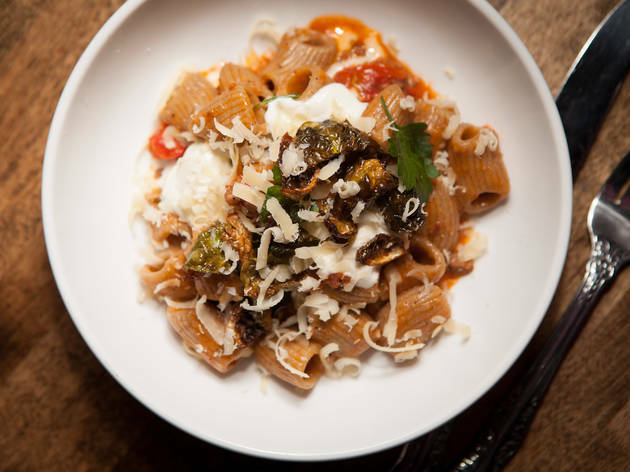 Make sure one of them is the black pepper rigatoni, short, peppery nubs of pasta coated with wild boar ragu, Brussels sprout leaves and shreds of Parmesan. It’s slightly creamy with some heat from the pepper, and exactly the sort of dish cold Chicago nights demand. 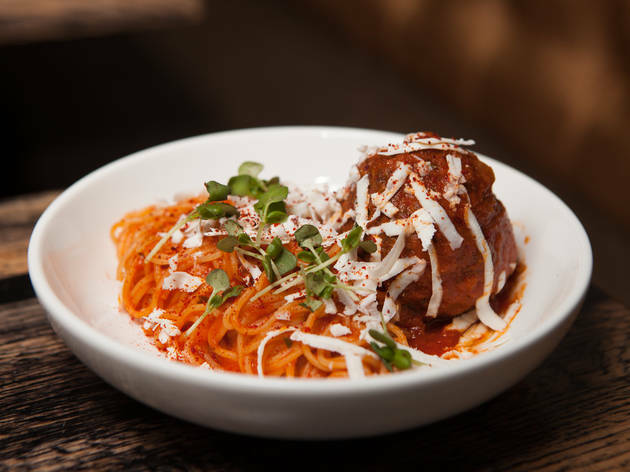 The spaghettini and meatballs comes sauced with an excellent marinara that also coats the large, serviceable meatball. 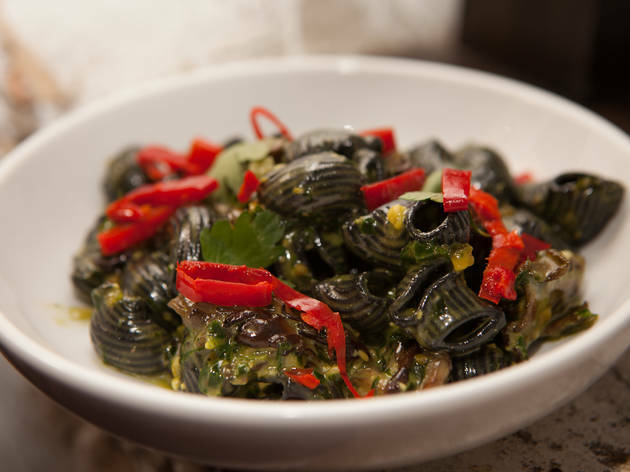 The squid ink lumache, snail-shaped pasta tossed with snails, hen of the woods mushrooms, chilies and a parsley pesto, is deeply flavored and satisfying. But the rest of the menu doesn’t quite reach the same level as the pastas. Octopus tentacles, showered with crisp breadcrumbs fried in marrow, were charred to the point of tasting burned. Ditto for the guinea hen, so we ate around the meat, focusing instead on the grilled endive and creamy parsnip risotto (which is also available as a side). For dessert, a large portion of budino, topped with pistachio crumble, was positively doused with saba (a grape syrup that’s similar to balsamic vinegar), which overwhelmed the pudding. Service was a little harried. Our server was visibly frustrated when no one brought us water for a good 10 minutes, and when I asked for a white wine recommendation, she threw out two names, then ran off and brought me a Verdicchio. It was a clean, minerally wine I liked, but more thoughtful wine service is in order. 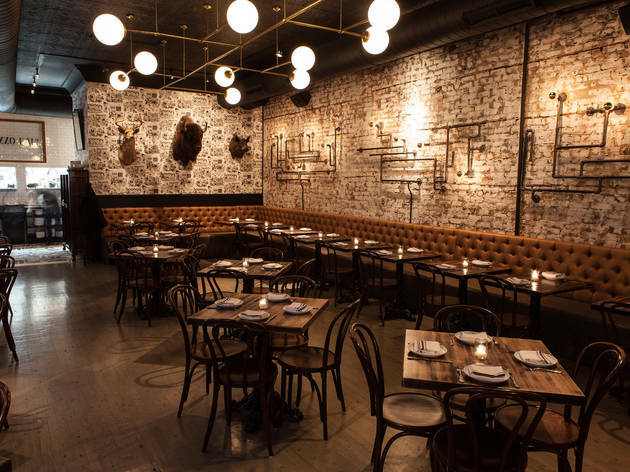 Even as Charlatan refines itself—and I have no doubt it will, given the level of execution at Three Aces—you can still have a solid meal. 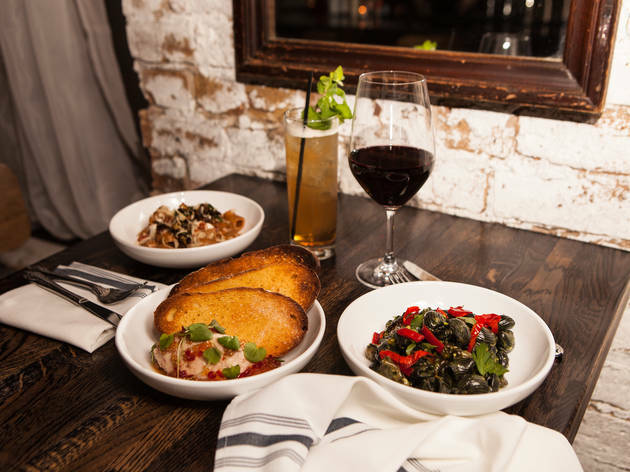 Sit at the bar, toss back a couple of cocktails and stick with the pastas. 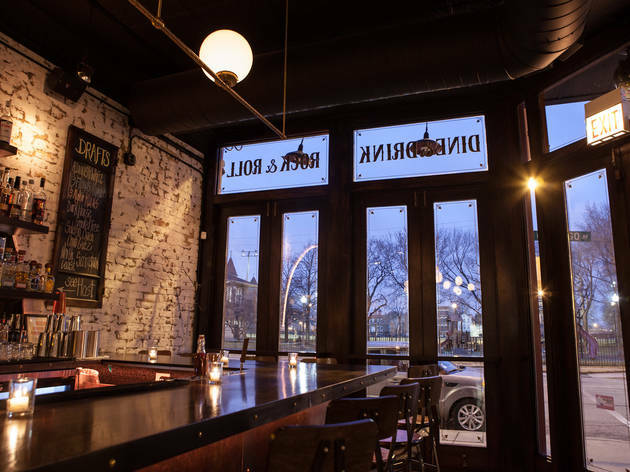 You can now get Troost’s pastas in two neighborhoods, and that is a very good thing, indeed. El: Blue to Chicago. Bus: 56, 66. I don't like to overly advertise this place, just because I kind of want it all to myself and not get packed from getting hyped up. 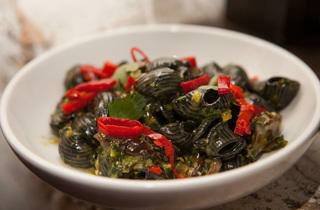 But what is not to love about 5-6 different kind of handmade pastas, including my most recent squid ink lumache with snails and parsley pesto, or the appetizers that can be eaten alone and not shared, like the gnoccho fritto - a little dough fritter topped with prosciutto, creme fraiche and caviar? I'm literally salivating just at the though of coming back for that appetizer alone. 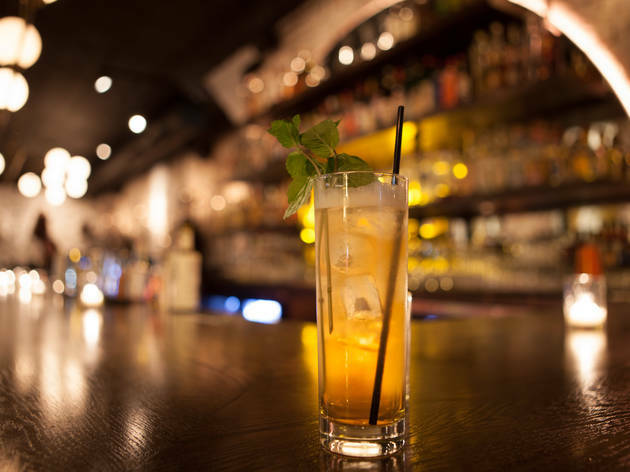 The drinks are great, the ambiance is adorable; especially with the wallpaper that makes you do a double take when you realize there are dancing skeletons on it. 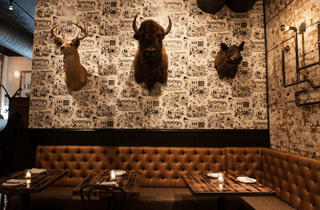 Plus, free postcards so you can write home to you friends and family about the droolworthy meal you just had. 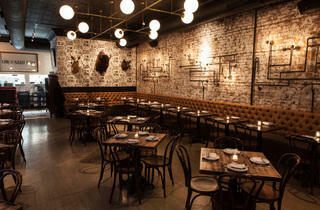 Some of the menu items on Charlatan are hit or miss, but their meatballs were so good that it honestly didn't matter. They've got a great cocktail menu (with STRONG drinks) and the wait staff was super friendly and helpful with recommendations. Plus the atmosphere is absolutely adorable.